Poisson regression is for modeling count variables. This example was done using SAS version 9.22. Example 3. A researcher in education is interested in the association between the number of awards earned by students at one high school and the students’ performance in math and the type of program (e.g., vocational, general or academic) in which students were enrolled. For the purpose of illustration, we have simulated a data set for Example 3 above: https://stats.idre.ucla.edu/wp-content/uploads/2016/02/poisson_sim.sas7bdat. 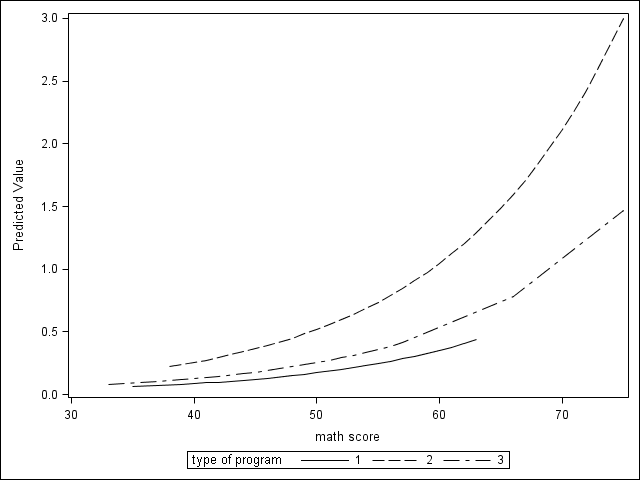 In this example, num_awards is the outcome variable and indicates the number of awards earned by students at a high school in a year, math is a continuous predictor variable and represents students’ scores on their math final exam, and prog is a categorical predictor variable with three levels indicating the type of program in which the students were enrolled. It is coded as 1 = “General”, 2 = “Academic” and 3 = “Vocational”. We can look at summary statistics by program type. The table below shows the mean and variance of numbers of awards by program type and seems to suggest that program type is a good candidate for predicting the number of awards, our outcome variable, because the mean value of the outcome appears to vary by prog. Additionally, the means and variances within each level of prog–the conditional means and variances–are similar. A frequency plot is also produced to display the distribution of the outcome variable. At this point, we are ready to perform our Poisson model analysis. Proc genmod is usually used for Poisson regression analysis in SAS. On the class statement we list the variable prog, since prog is a categorical variable. We use the global option param = glm so we can save the model using the store statement for future post estimations. The type3 option in the model statement is used to get the multi-degree-of-freedom test of the categorical variables listed on the class statement, and the dist = poisson option is used to indicate that a Poisson distribution should be used. Statement “store” allows us to store the parameter estimates to a data set, which we call p1, so we can perform post estimation without rerunning the model. prog         3     0      0.0000      0.0000      0.0000      0.0000           .           . The output begins with the basic model information and then provides a list of goodness-of-fit statistics including the log likelihood, AIC, and BIC. Next you will find the Poisson regression coefficients for each of the variables along with standard errors, Wald Chi-Square statistics and intervals, and p-values for the coefficients. The coefficient for math is .07. This means that the expected increase in log count for a one-unit increase in math is .07. For our three-level categorical predictor prog, the model presents coefficients relating levels 1 and 2 to level 3. The indicator variable prog(2) is the expected difference in log count between group 2 (prog=2) and the reference group (prog=3). So the expected log count for level 2 of prog is 0.714 higher than the expected log count for level 3 of prog. Similarly the expected log count for level 1 of prog is 0.3698 lower than the expected log count for level 3. To determine if prog itself, overall, is statistically significant, we can look at the Type 3 table in the outcome that includes the two degrees-of-freedom test of this variable. This is testing the null hypothesis that both prog estimates (level 1 vs. level 3 and level 2 vs. level 3) are equal to zero. We see there that prog is a statistically significant predictor. To help assess the fit of the model, we can use the goodness-of-fit chi-squared test. This assumes the deviance follows a chi-square distribution with degrees of freedom equal to the model residual. From the first line of our Goodness of Fit output, we can see these values are 189.4495 and 196. This is not a test of the model coefficients (which we saw in the header information), but a test of the model form: Does the poisson model form fit our data? We conclude that the model fits reasonably well because the goodness-of-fit chi-squared test is not statistically significant. If the test had been statistically significant, it would indicate that the data do not fit the model well. In that situation, we may try to determine if there are omitted predictor variables, if our linearity assumption holds and/or if there is an issue of over-dispersion. Cameron and Trivedi (2009) recommend using robust standard errors for the parameter estimates to control for mild violation of the distribution assumption that the variance equals the mean. In SAS, we can do this by running proc genmod with the repeated statement in order to obtain robust standard errors for the Poisson regression coefficients. prog      3   0.0000   0.0000   0.0000   0.0000     .      .
We can see that our estimates are unchanged, but our standard errors are slightly different. We have the model stored in a data set called p1. Using proc plm, we can request many different post estimation tasks. For example, we might want to displayed the results as incident rate ratios (IRR). We can do so with a data step after using proc plm to create a dataset of our model estimates. The output above indicates that the incident rate for prog=2 is 2.04 times the incident rate for the reference group (prog=3). Likewise, the incident rate for prog=1 is 0.69 times the incident rate for the reference group holding the other variables constant. 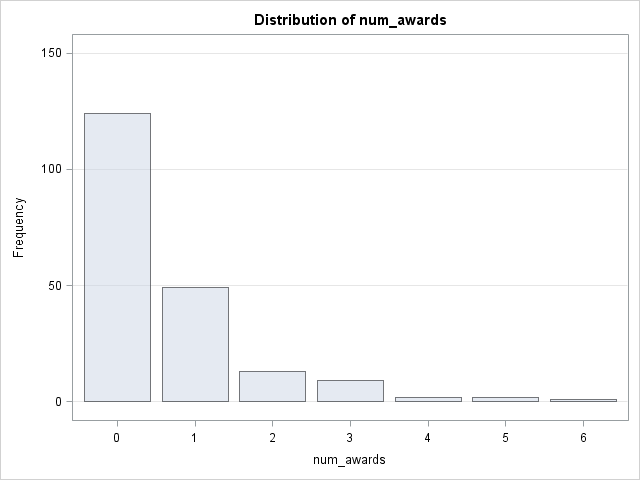 The percent change in the incident rate of num_awards is 100 × (1.07267 – 1) % ≈ 7 % for every unit increase in math, holding other variables constant. Below we use lsmeans statements in proc plm to calculate the predicted number of events at each level of prog, holding all other variables (in this example, math) in the model at their means. We use the “ilink” option (for inverse link) to get the predicted means (predicted count) in addition to the linear predictions. The first block of output above shows the predicted log count. The second block shows predicted number of events in the “mean” column. In the output above, we see that the predicted number of events for level 1 of prog is about .21, holding math at its mean. The predicted number of events for level 2 of prog is higher at .62, and the predicted number of events for level 3 of prog is about .31. Note that the predicted count of level 1 of prog is (.2114/.3060) = 0.6908 times the predicted count for level 3 of prog. This matches what we saw in the IRR output table. Below we will obtain the averaged predicted counts for values of math that range from 35 to 75 in increments of 10, using a data step and the score statement of proc plm. The table above shows that with prog at its observed values and math held at 35 for all observations, the average predicted count (or average number of awards) is about .13; when math = 75, the average predicted count is about 2.17. If we compare the predicted counts at math = 35 and math = 45, we can see that the ratio is (.2644714/.1311326) = 2.017. This matches the IRR of 1.0727 for a 10 unit change: 1.0727^10 = 2.017. You can graph the predicted number of events using proc plm and proc sgplot below. Assuming that the model is correctly specified, you may want to check for overdispersion. There are several tests including the likelihood ratio test of over-dispersion parameter alpha by running the same regression model using negative binomial distribution. One common cause of over-dispersion is excess zeros, which in turn are generated by an additional data generating process. In this situation, a zero-inflated model should be considered. If the data-generating process does not allow for any 0s (such as the number of days spent in the hospital), then a zero-truncated model may be more appropriate.